Two days ago, one of Rome’s most important and beloved sacred monuments was made accessible to the faithful after the completion of a lengthy and very much needed restoration. 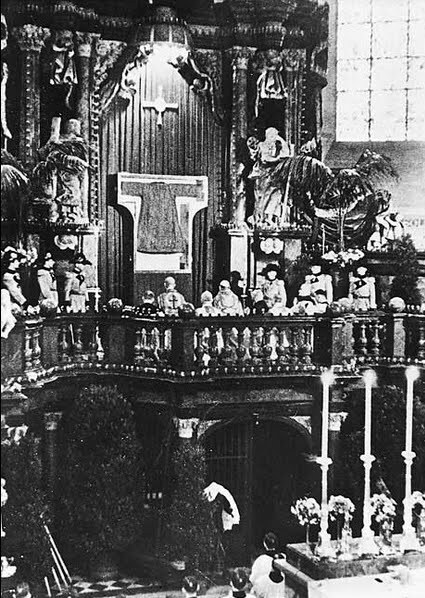 The Holy Stairs are said to be the very ones which the Lord climbed on the way to His trial before Pilate, discovered by St Helena and sent to Rome; since the reign of Pope Sixtus V (1585-90), they have been housed within a special shrine across the street from the cathedral of St John in the Lateran. The fresco work on the walls to either side of the stairs and on the ceiling above them was in dire need of cleaning and repair, which necessitated closing them off completely, although the shrine itself remained open. The restoration is now completed, and pilgrims now once again are able to honor Christ’s Passion by climbing them, which is always done on one’s knees. Photo courtesy of Joacob Stein. By the year 1732, most of the individual stairs had deep grooves worn into them, and in a few places, had been worn completely through, by the passage of so many centuries of pilgrims. They were therefore encased in thick walnut covers to protect them, although they could still be seen and touched through slots in the wood. 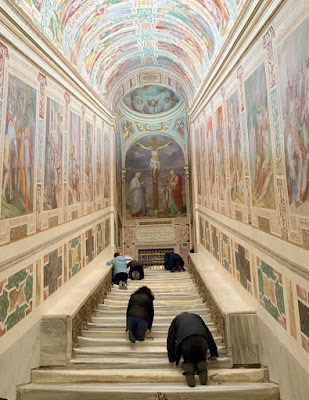 These covers are themselves in need of repair, so while they are being worked on, pilgrims can ascend on the bare marble of the original stairs. (For the sake of those who have mobility issues, it should be noted that the grooves and the smoothness of the marble make the climb much more difficult than it is when the stairs are covered.) The wooden covers will be put back on after Pentecost. In this report from Catholic News Service, made when they were first removed a few weeks ago, you can see the many pieces of paper on which people had written prayers and then slipped them between the covers. 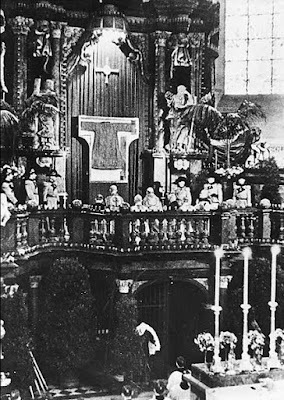 There are also certain spots on the stairs which are seen marked off with grills (these have now been removed), traditionally said to be marked with drops of Christ’s Blood. Then, having rendered Government House uninhabitable she bade her court find billets where they could, and herself settled in a single small room among the nuns of Mount Zion where she did her own housework and took her turn in waiting at table.